If you are using POP to get your mail. If you email account is over it quota and using POP mail, you need to remove emails from the server to free up some space. To do so, open up your email program preferences, click on account, click the advance tab and change the pull down menu to read "After one week". close the preferences, save the changes and then check your email. this should download all the emails over one week old and delete them off the server. 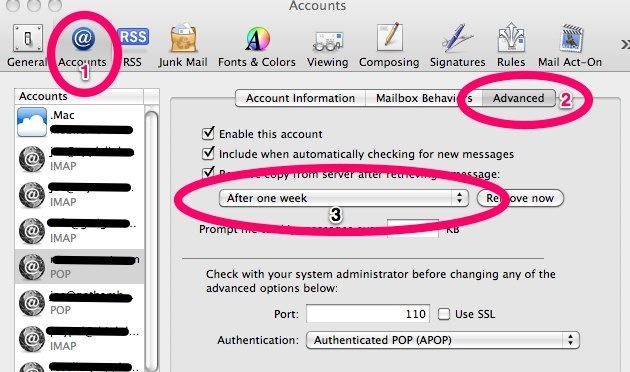 If you are using IMAP to get your mail. If you email account is over it quota and you are using IMAP, you need to remove emails from the server to free up some space. To do so, just drag emails from any mail box/folder to any folder that is listed under "On My Mac" this will remove the emails from your server and store them locally on your mac.